Note This Chuck will not fit direcly onto your spindle requires an insert. 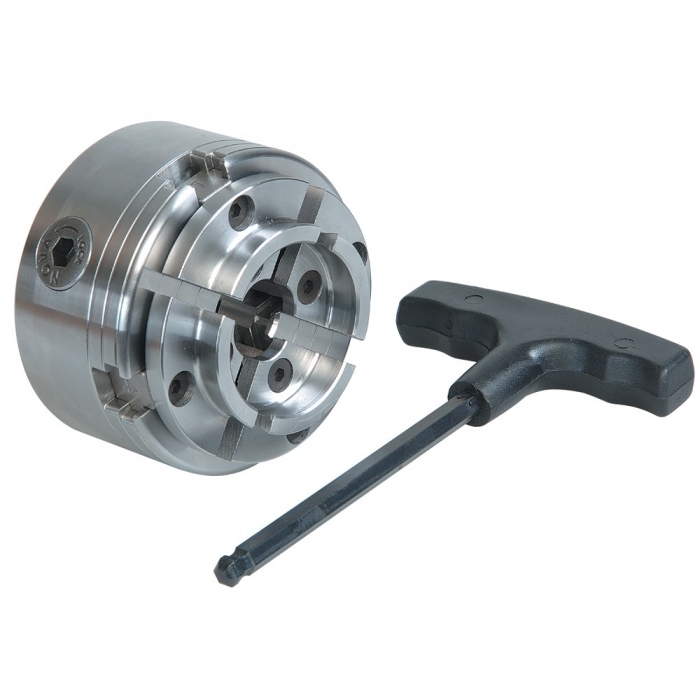 Many turners may already have an insert so dont require one, however we recommend with a new chuck a new insert is used as there maybe some wear in your old insert/adapter. - Common Accessory Jaw Fixing Profile – compatible across all NOVA chucks and accessories. - High Tech Precision Composite Jaw Slides. - Special Woodturning Dovetail Profile on Jaws. - Auto Safety Stop Feature. Jaw slides can’t protrude past the chuck body. - Common Insert/Adaptor Fitting – compatible across all NOVA chucks. - Safe Lock™ Woodworm Screw. IMPORTANT NOTE - you need to chose an insert to adapt this chuck to your lathe. See Insert section. The price reflects that insert is required as an extra and is not included. Please see the insert/adapter chart that is available in the downloads section below. - Fully sealed composite indexing backing plate. Made from ultra tough Duracon composite, reinforced with stranded glass fibres for extremely long life in tough conditions. Self lubricating properties. Unique indexing function built into backing plate. Holographic sticker for NOVA authenticity. - Powerful Geared Grip with Tuff Lock™ Technology. Precise, hardened geared action delivers incredible smooth strength. Solid, vibration free. - Single Handed Operation. Fast and convenient when mounting your project. More time spent turning and less time spent preparing. - Captured pinion and Ball nose Allen key with large, easy grip handle. Fast, positive location, easy and comfortable to use. Rotation arrow for easy reference and fast opening and closing action. Unique, tilt away action, means it can be angled back in operation, away from work. - Body made from precision machined 1045 High Tensile Steel, with a polished self metal finish to allow for closer tolerances. Click the button below to add the SUPERNOVA2 INSERT CHUCK - INSERT REQD to your wish list.